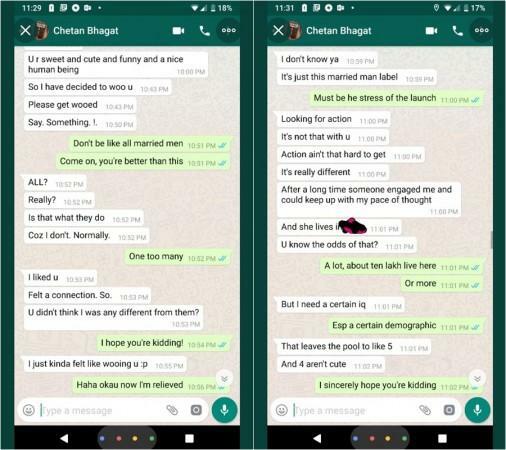 India’s best-selling author Chetan Bhagat took to Facebook on Saturday to apologise to a girl after screenshots of their private WhatsApp chats started becoming viral on social media. 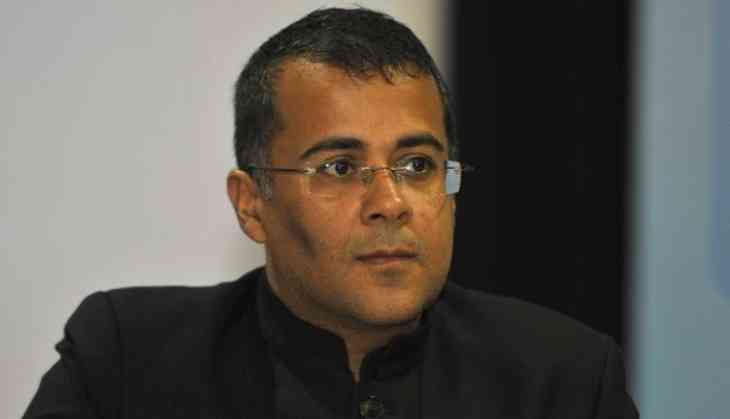 Chetan Bhagat in a long Facebook post, admitted that the screenshots of the conversation that were doing the rounds on internet were real, which he had several years ago. I would like to make a couple of points about the screenshots that someone has shared just a couple of hours ago. It has taken me this much time because I saw them a bit late, and then I was in a conversation with Anusha. I am telling you all whatever I told her, which to my recollection is the truth. But first of all, I am really sorry to person concerned. The screenshots, are of course real, and I am sorry if you felt they were wrong I hope you will accept my apology. Just in terms of more information, these screenshots are several years old, and I had met the person in question a couple of times. We hit it off really well as a friendship, and as I say in the screenshots, I did feel a strong connection with her. I did find her a good human being, sweet, cute and funny (as I also say in the screenshots). As I also say in the screenshots, I realized I was married and this was not about looking for any action. I just had not felt that kind of connection in a while. Maybe I was going through a phase, maybe these things just happen, or maybe I felt the person felt the same too based on our conversations (which I don't need to repeat here). However, it was stupid of me, to feel that way and to even share that with her. I just told Anusha about it as well, and apologized to her for doing the same. I should have had better judgement, but I guess I erred a bit there. Maybe I misread the friendliness. Also, I am not completely sure because it was long ago, but the 'wooing' bit may have come from a conversation we had about how nobody woos anyone anymore and how sometimes one misses being wooed. My new book then was also about women (One Indian Girl) and we also discussed wooing and relationships in that context. Also, I also want to clarify that there never was was nothing physical, no lewd pictures or words that were ever exchanged. I think I deleted the person's number soon thereafter and we haven't been in touch for years. We do feel certain things sometimes, and I did too. I found this person special, and different from all others I had met. I shouldn't have, and maybe I shouldn't have shared it with that person in a private conversation either. Once again, I am sorry to the person concerned, and of course most of all to Anusha. I hope you can forgive me. For everyone's information, am running this response past Anusha first, to ensure she is okay with it."